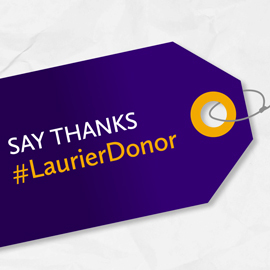 Thank a Laurier donor because their generosity helps make the Laurier we love possible. That was the message relayed this week as hundreds of tags were posted across Laurier’s Waterloo and Brantford campuses. These tags were placed around Laurier to showcase and recognize the many areas that are enhanced or expanded by philanthropic investments. While not all of the items provided through donations are tagged, every tag aims to highlight the many ways in which donations positively impact the university and the Laurier student experience. Spearheaded by Laurier’s Student Alumni Association (SAA) volunteers, this celebration of philanthropy aims to build awareness within the Laurier community about the exceptional community of donors that backs every Laurier student. At interactive events hosted by Laurier SAA in Waterloo and Brantford, students were encouraged to “say thanks” to the remarkable community of donors who make the Laurier they love possible. Check out the SAA blog about Tag Day. To join Laurier’s remarkable community of donors and make your own gift, visit laurieralumni.ca/giving.